The E3 Flight begs to be flown. It wants you to feel like you’re a space pilot in a movie. You don’t have to resist the urge to make sci-fi noises as you lock and engage the battery, mount the saddle, and power up the display (Commencing count down: Ten, Nine, Eight…). Get clearance from command—then blast off. As you zoom through the neighborhood making engine sounds, ignore your neighbor’s jeers—they’re just jealous. A fast shifting, torque sensing, ten speed drivetrain that provides a smooth and accurate blend of motor and human power. Nimble performance that can handle whatever the road dishes out. With plenty of power and speed under your complete control, you arrive at your destination unfettered from the frustrations of more common transportation modes. 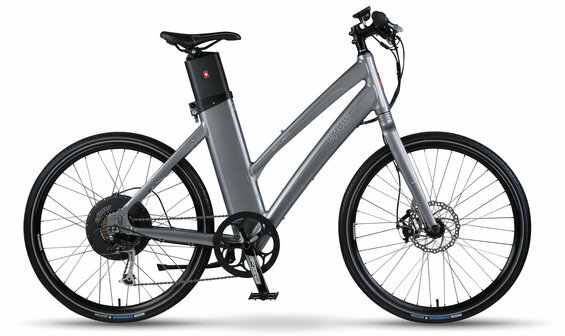 The in-frame seat tube battery is leading edge in power pack technology with smart charging and regenerative braking. You won’t think about it when you are riding, but you’ll love the versatility it provides.rnThe strength to handle pot-hole laden city streets with a function-designed alloy frame, fork and custom heavy-duty wheelset. Rack, fenders, lights – No problem, City Kit options are available. Choose from two 500 watt drive options: high speed for urban assault, or high torque to touch the sky.